Hanoi (VNA) – The forestry sector will support the issuance of sustainable forest management certificates on an area of 100,000ha per year as part of efforts to ensure that Vietnamese wood products satisfy all international requirements as the country joins free trade agreements. The sector has set the target of reducing 35 percent in damaged forest areas and in the number of violation cases compared to the 2011-2015 period by strengthening the law enforcement capacity. Furthermore, the wood processing industry will be developed by supporting the construction of processing factories, advanced technology forestry areas, and support industries in major economic regions. The sector will increase investment to upgrade forestry infrastructure, especially transport systems to reduce direct costs for planting, exploiting, transporting, and processing forestry products. 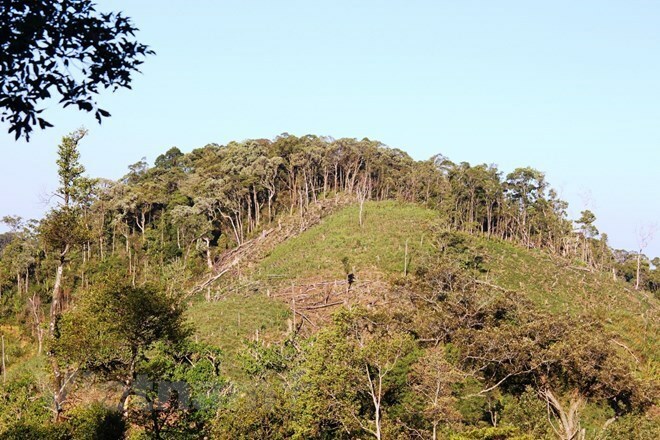 According to Deputy Minister of Agriculture and Rural Development Ha Cong Tuan, the ministry has launched a movement to complete and surpass all goals set in the sustainable forestry development programme for the 2016-2020 period. The ministry will strive to achieve the growth of 6.05 percent per year in 2020, with national forest coverage reaching 42 percent, he said. Other targets include 14.4 million ha of forest area of all kinds, average annual productivity reaching 20 cu.m of wood per ha, and 11 billion USD in export revenue of forestry products and wooden furniture. The sector will maintain the creation of 25 million jobs per year, helping to promote poverty production and improving foresters’ livelihood in line with the building of new-style rural areas and ensuring national security and defence, said Tuan.